One of the things that I am frequently asked is how to change or alter the sound of a piano, specifically how to correct the sound of a too harsh and metallic piano to make it sound smooth and mellow “European style” kind of sound. Is this possible, how do you do it? Well, the answer is yes but you must take into account some considerations. 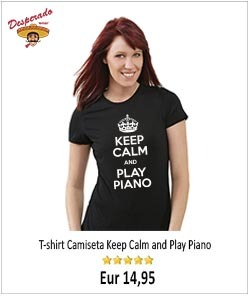 First thing first, why do so many people are interested in changing the tonal quality (sound) of their pianos? In my view, because most pianos low to medium quality nowadays are manufacture in Asia (mainly in China) and one of the characteristics of such pianos is their particular sharp and loud sound, maybe suited to the tastes in that part of the world, but not so much for European and American ears. The sound of a piano is determined by its construction and the materials it is made, specifically, the quality and type of the soundboard, the scale design, the type and quality of the strings, and the iron frame. But mainly, what sets the “color” of sound (say up to 50%) are the hammers, and is precisely the correct handling of the them that allows us in a certain degree to alter the sound of the piano. 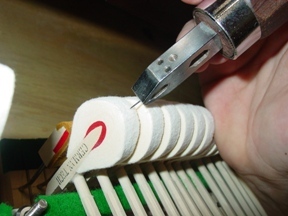 The manipulation of hammers to change the sound of a piano is called “Voicing”, also commonly known as “needling the hammers”. Voicing is undoubtedly the most delicate and subtle aspect of piano regulation, and requires fine ear and a good dose of patience. Normally this is a job for the competent technician, but I think that crafty and motivated amateurs can also try the technique, providing (of course) they proceed with caution. In short I will explain what is all about. The basic principle is to alter the fiber density of the hammers (a hammer with less fiber density sounds mellower) and the way to proceed is basically by shallow puncturing (no more than 1.5 mm. deep) with a needle, the area of the hammers that hits the strings (about 1 cm. wide). Puncture the hammer just a little (6 or 7 times), test the sound, and puncture again till you are satisfied with the sound, repeat if need it be and then move to next hammer. It doesn’t sound too difficult, does it? Before you begin, apply a light sanding on the hammers tips. Do no more than 6 or 7 punctures at a time, then test the sound. If after 3 or 4 sessions of 6/7 punctures you don’t hear any difference in the sound of that note, stop and leave it there. If you carry on needling, you risk damaging the hammer! Grab the hammer solidly but gently, you don’t want to damage or break the hammer shank or the flange. Before applying this voicing technique, as far as possible is advisable to gain some experience by practicing in a low cost old piano. To those of you truly interested in this topic, I would recommend reading in depth Chapter VII of my book “How to repair a piano” where is explained in detail the voicing technique and its specific step by step procedure. Thank you for your comment. You are right, over-needling the piano can damage the hammers, that’s why I reccomend always to proceed with caution and first doing some practice with an old and low cost piano. 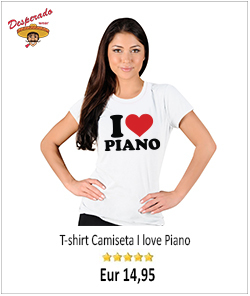 By the way, I had a look to your site http://www.pianomusicinfo.com, very nice web, congratulation. You have to be very careful of over-voicing the piano, as it can damage your instrument. 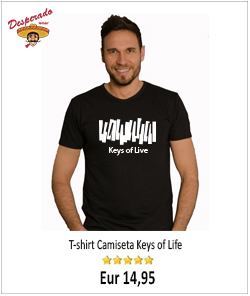 <a href="pianomusicinfo.com"